New Delhi: The Planning Commission has recommended that the unique identity (UID) programme’s beneficiaries such as public sector banks, insurance companies, state governments and welfare programmes pay for the enrolment of people since the benefits to them will outstrip the costs incurred. The suggestion has been made in a note to the cabinet committee on UID project headed by Prime Minister Manmohan Singh. The issue is likely to be discussed in the cabinet meeting scheduled for Thursday. The Planning Commission’s recommendation was confirmed by two senior government officials but neither of them wanted to be identified due to the sensitivity of the matter. The Unique Identification Authority of India (UIDAI) currently pays ₹ 50 per enrolment to its registrars and spends another ₹ 25 on dispatching the letters to residents. Currently, UIDAI has a grant that entitles it to collect biometrics of 200 million people after which NPR is supposed to take over. UIDAI has already registered around 120 million people in its system and expects to complete the rest in the next two-three months. On the other hand, considering that NPR has only enrolled around 7.5 million so far, the Planning Commission has approached the cabinet to take a call on the matter. “I don’t think UIDAI should stop its work now that it has already crossed an important milestone. I also don’t think there’s an issue of NPR’s data being secure and UID’s being not reliable as both of the projects don’t give proof of citizenship in any case," said the first official cited above. This option of UIDAI continuing with its multi-registrar model of enrolment without funding (where other agencies pay for it) could ensure that the project is not stalled after it touches 200 million and will avoid duplication of government spending on both projects, which are on similar lines. The UID programme is also known as Aadhaar. “Projects such as (MG)NREGA (the Mahatma Gandhi National Rural Employment Guarantee Act) benefit significantly from UID as it reduces leakages," said the same official. MGNREGA has a budget of ₹ 40,000 crore and it can easily pay some of this for getting its beneficiaries enrolled, the person said. The second government official cited the method by which the income-tax Permanent Account Number (PAN) is assigned. The National Securities Depository Ltd (NSDL) has permission from the revenue department to charge a small fee for doing so. Another proposal made in the note talks about NPR becoming the sole biometric collection agency in the country for any kind of government project. Currently, there are several states that are collecting biometrics for various projects across the country. The idea behind this suggestion is to ensure that biometrics collected by NPR are used by multiple agencies. Another proposal reiterated a previous suggestion to share data between NPR and UID. RGI is opposed to this, doubting the authenticity of the biometrics collected by UIDAI. “NPR has been given a process by the government; unless the process is changed, we are duty-bound to follow it," said a government official close to the NPR project who did not want to be identified. NPR has much higher levels of security, he said. “We are very firm that any data which has not been authenticated will not be accepted in the NPR." Even though RGI and home minister P. Chidambaram have repeatedly raised concerns about the reliability of UID data, they have specifically mandated in their tender document that biometric collection agencies “empanelled by Aadhaar" will qualify for NPR. 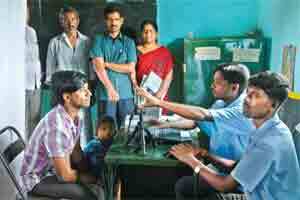 Meanwhile, UIDAI has maintained that it is following best practices while enrolling residents. The fourth recommendation says that NPR should not collect biometrics as UID is already fulfilling the mandate. Former chief statistician of India and currently principal adviser to the Planning Commission, Pronab Sen, said, “The question is what is the division of labour between the two projects. The whole argument should not be about one-time registration of the people but about maintaining it as well in the future."